Bluetooth is a very modern technology but even Classic car drivers must be legal with hands-free if they want to use a mobile telephone while driving. Our Parrot range is excellent and we also have some hideaway systems perhaps more suited to Classic cars. Why not enjoy digital audio broadcast listening in your classic car too? The latest offering in retro dab car radio from Retrosound is the San Diego This DAB unit will be available from October 2017. 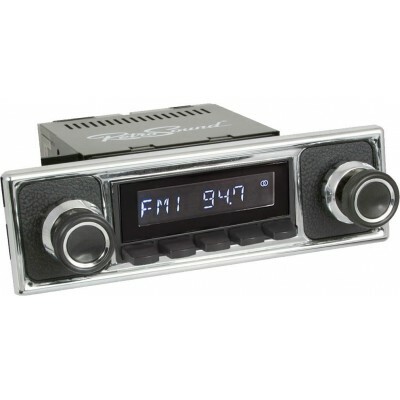 Classic car radio with dab is long overdue and this unit will be a winner. 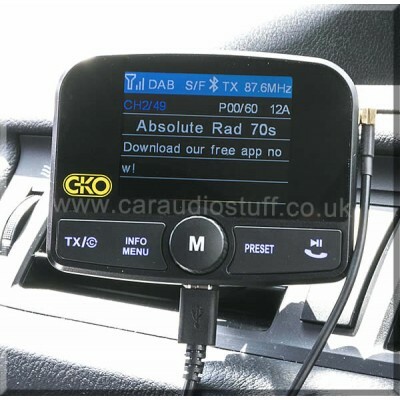 DAB digital radio hide away add-on systems or integrated DAB units for your Classic car is also available. Listening to MP3 or iPod/iPhone music is also easy with our MP3 adapters. Bluetooth music streaming, AUX input to allow you to play your own playlists and hands-free call button keeps you safe and legal. RetroSound’s San Diego radio is designed to work with most classic vehicles. San Diego has a built-in DAB/DAB+ tuner and is a full-featured radio, with Made-For-iPod/iPhone compatibility and built-in Bluetooth for hands-free calling and wireless audio streaming. A powerful 25 watts RMS x 4 channel amplifier is built in, and RCA pre-outs – plus subwoofer output – are provided for adding external amplifiers. San Diego has a 32,000 colour display to customize it to your vehicle’s interior. Two USB inputs for iPod/iPhone or USB flash drives and two standard auxiliary inputs provide plenty of flexibility.